Read the FAQ for information related to the project. 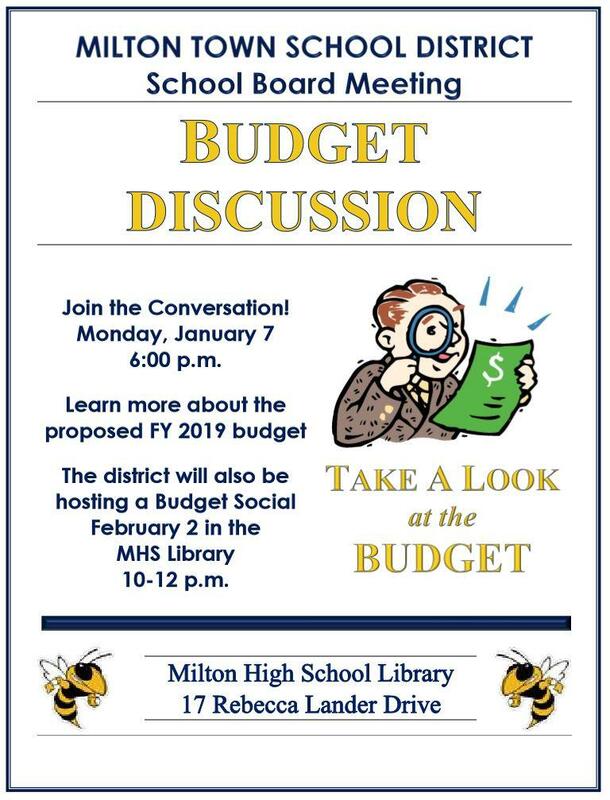 The Milton School District is seeking parents, students, staff, and community volunteers to serve on our Special Budget Communications Committee. The Committee will play an important role in disseminating the FY20 budget details. If you are interested in volunteering please attend the meeting tonight in the MEMS Library, 42 Herrick Ave. Meeting will begin at 5:30 p.m. Everyone is welcome! We are pleased to announce that MTSD's Director of Food Services has been nominated as 2018-2019 LifeChanger of the Year. The LifeChanger of the Year program recognizes and rewards K-12 school employees who make a positive difference in the lives of students. Please access Steve's LifeChanger page and post a congratulations or supportive comment. The LifeChanger selection committee pays special attention to the nominees with a lot of supportive comments from their communities. Join the conversation at the School Board meeting on Monday, December 17th! The Milton Town School District has decided to extend the deadline for the survey until November 15, 2018. It is our hope that the extended time will enable greater participation. Please take a few minutes to let your voice be heard. This Milton School District recognizes that parent and community engagement is a key factor in the academic and social success of our students. We understand that communications is an area that we can greatly improve upon. Your open and honest feedback will enable us to better understand our communication strengths and weaknesses which ultimately will result in well informed decisions on how to improve our current communications system. This survey will take around 7-10 minutes to complete and will close on November 15, 2018. Thank you for helping improve our communications process! Fridays are Milton Pride days. Check out the latest Milton apparel and complete the order form to show your school spirit. Orders due October 12th. Please take a few minutes to complete this short survey. This is a preliminary step in understanding if there is continued interested in discussing a change in start time. Any additional steps will be communicated well in advance of any action being taken in the schools.